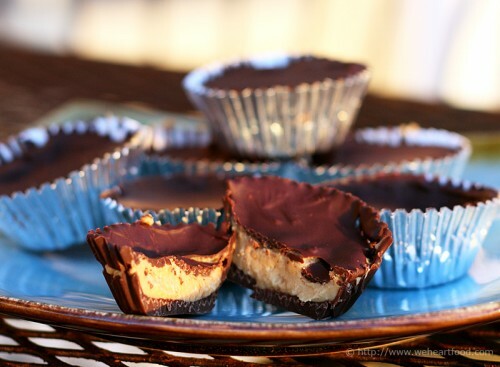 Lisa recently made these peanut-butter cups while we were on the Oregon Coast with the Small Clan — this is the second go-round for Lisa experimenting with peanut-butter cups, and it was a definite winner. The peanut-butter filling has the perfect texture thanks to the addition of crushed up graham crackers (!!) — I know, right? This recipe was found @ Pete Bakes, and for how surprisingly easy (and delicious!) they are, will surely be made again. Who keeps leaving half ones? And can I finish them? I don’t taste the graham cracker, just delicious peanut-butter-filled goodness. It’s a good thing I didn’t make 40 of these… we’d have polished them all off! In a medium bowl, mix together the peanut butter, confectioners’ sugar and graham crackers. Set aside. In a metal bowl over a saucepan with boiling water, carefully melt the chocolate. Use a pastry brush or a spoon to brush the melted chocolate on the bottom and sides of mini cupcake liners. This will be the base for your cups, so if in doubt, slather on more chocolate — you don’t want the lining too thin. Put the cupcake liners on a plate and place in the freezer for 10 minutes. Remove from the freezer, and place about a teaspoon of the peanut butter mixture in each cup. Press down a bit to spread. Spoon more melted chocolate on top of each cup. Place the peanut butter cups back in the freezer for another 15 minutes to set. Allow cups to get to room temperature before serving, or just serve cold! 12-16 mini peanut butter cups. This entry was posted on Saturday, June 19th, 2010 at 3:40 pm	and is filed under Desserts. You can follow any responses to this entry through the RSS 2.0 feed. You can leave a response, or trackback from your own site. I usually don’t go in for chocolate candy but peanut butter cups are the one exception to that rule. Especially covered in dark chocolate. Of all things. Do you think these will keep in the mail to NZ? Nope, probably not. Guess you’ll have to come back to Seattle to try some.